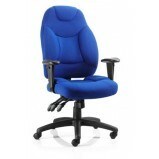 Office Furniture GB offers a great selection of low cost Task Chairs. 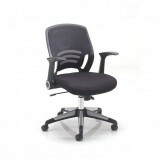 All our task chairs come with a host of features to help workers remain comfortable and productive. 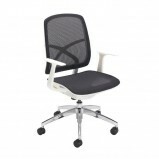 Most task seating also comes in a variety of colours. Barcelona Deluxe Fabric Operator ChairDesigners created a posture chair classic when they engineered Barcelona. 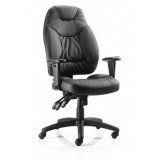 Highly functional with more movements than a Swiss watch Barcelona guarantees owner appreciation When efficiency is all-im..
Barcelona Deluxe Black Leather Operator ChairDesigners created a posture chair classic when they engineered Barcelona. 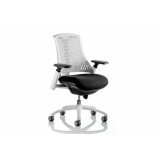 Highly functional with more movements than a Swiss watch Barcelona guarantees owner appreciation When efficiency is..
Flex Office Chair The Flex uses modern materials to create a chair that is practical and innovative with features such as pliable and flexible backrest, adjustable gel padded arms, a large cushioned seat with waterfall front and an enclo.. Fabric seat, back and outer Quality stitch detail Wind up weight tensioner Multiple functions Ergonomic contoured seat and back promoting good posture Gas lift tested up to 150kg Options Black or blue fabric ..
Soft bonded leather seat, back and outer Quality stitch detail Wind up weight tensioner Multiple functions Ergonomic seat and back promoting good posture Gas lift tested up to 150kg Options Available in both Bl.. 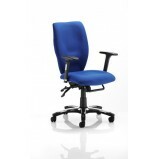 Shaped back with contoured seat Seat slide adjust to promote better seating posture Black nylon base with chrome detail Adjustable arms Gas lift tested up to 150kg Options Black or Blue fabric ..